I remember the first day I met Jen like it was yesterday. It was the first Friday of the first week of school in the fall of 2004. She was a freshman and had just pledged Sigma Kappa. That year, I was recruitment chair and as we all gathered for our Bid Day activities that night, I had the greatest sense of pride. I was so proud, because I knew my chapter accomplished what it set out to achieve during sorority recruitment: recruit women of character. At our Bid Night activities, we first met at our newly built house. Everyone gathered in the living room to sit and introduce themselves before we headed out for our activity. Jen sat on the couch closest to the doors leading to the Alpha Phi house. When the curly redhead said, “I’m Jen!” with the greatest of smiles beaming across her face, I knew we had somebody special amongst us. I’m grateful that I got to know Jen better after that first simple and innocent introduction. As I got to know Jen more throughout the seven years I knew and called her a friend and sister, it became clear that her life was about one thing: Love. 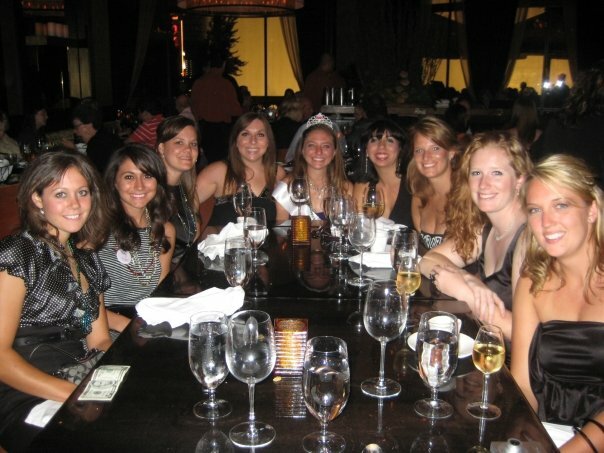 Jen would often speak to her Sigma Kappa sisters and friends about her desire to get married. She was an incredibly bright soul whose mind would allow her to do anything in the world. Yet, her dreams were simple and pure. The greatest thing she wanted, was to be loved and love others. I think I speak for everyone when I say how lucky Jen was to find Logan and to marry him. Jen found one of the most solid and caring men on the planet. They were each other’s rocks and Jen got to live out her dream on earth. She loved. As chance would have it, Jen was diagnosed with leukemia on the day set specifically on our calendars to recognize love: February 14, 2011. That date would foreshadow the way that Jen battled against leukemia and how she lived out the days with her life. Throughout her courageous fight against cancer, Jen fought with love. As Jen underwent tests and hellish procedures, she never cried out, “Why me?” Rather, she kept on loving others and kept her own pain and fears quiet. She proudly shared about her brother Steven’s acceptance to Yale. She would share pictures of his costume design work with friends and wrote the kindest tributes to him as he prepared to make the move back east. She celebrated the birth of friends’ children and changed her Facebook picture to commemorate their arrival on earth. She visited other soldiers in the fight against cancer and stood at their bed sides wishing them peace on their journey when her own was in full-force. Even as she faced the toughest battle of her life, life was not about Jen. Rather, for Jen, life remained to be about loving others. The greatest gift Jen gave me as a friend was serving as an example of what complete faith in Christ as our savior looks like. During a 20-month battle against cancer, Jen never said, “Why me, God?” Rather, she woke up and fought against cancer everyday with prayer. Each day, friends across the country would set their alarms to 7 p.m. and all join in prayer for Jen. Her mother, Shelley, wrote a beautiful online journal about Jen’s journey, and no matter what happened on a given day, Shelley ended each post with “We are thankful for today! !” In the face of such an awful disease, I truly believe that the reason why Jen and her family continuously gave thanks, was because of their complete faith in Jesus Christ as our savior. Jen, your complete faith in Jesus helped bring me back to Him. In part because of you, I open my Bible now every single night and turn its pages. That you found peace during your battle is a reminder to each and every one of us of that promise that was made on the cross. I’m still working at it, but I want that absolute faith that you knew. I know, that because of your absolute faith in Christ that today, you are celebrating in heaven. You are free from the pains of this world and are surrounded by the only thing you ever wanted: love. Throughout her battle against leukemia, Jen became a vocal advocate for others to become bone marrow donors. Because of Jen, many of her friends and those people’s friends have signed up to become bone marrow donors. Even as she was undergoing what can only be described as exhausting and draining medial procedures, Jen hit the pavement to get the word out about bone marrow donorship. Jen hosted bone marrow donor drives from places like her alma mater, the Colorado School of Mines, to the Chick-Fil-A owned by her parents. While Jen accomplished much in her life, save for her wedding day, I don’t think I ever saw her look more proud than when she met in the hospital with a donor who signed up at one of her drives after he donated bone marrow. Jen worked alongside Love Hope Strength, a foundation dedicated to finding new bone marrow donors at rock concerts. CBS This Morning even documented her passionate work with the organization. Jen’s mission to encourage others to become bone marrow donors has only just begun. Our sorority committed itself to the cause last night, making Love Hope Strength its local philanthropy. I think it’s safe to say, too, that each and every one of Jen’s family members and friends will continue to support bone marrow donor drives. Jen, I’m going to miss the simple grace by which you lived life. You were a gem on this earth–a young person who lived life unadulterated. You gave more of yourself than anyone could have ever asked of you to everyone you came across. You did this throughout your entire life–never stopping once to put yourself ahead of your concern for others. Your spirit for life shined through your eyes and that beautiful red hair. You’ll live on always, Jen. Because you were so loved. You can donate to Love Hope Strength in memory of Jen, here. What a lovely soul Jen is! She is fortunate to have friends like you who see her true beauty and carry her legacy. Beautiful! I’m sure Jen is looking down and smiling. You are an amazing writer, Alicia, and this is an excellent tribute to Jen. I’m Jen’s Aunt Lauree and I have to say you are spot on in your blog. What a beautiful summation of Jen’s life. I especially thought your point about her being capable of so much, but finding the more traditional things like marriage more important. Her mom is like that – an incredible mind, but fulfilled by those around her. Her gifts really came through in Jen’s journey – her nursing background, her ability to teach, and her gift for writing. Thanks for writing this! !